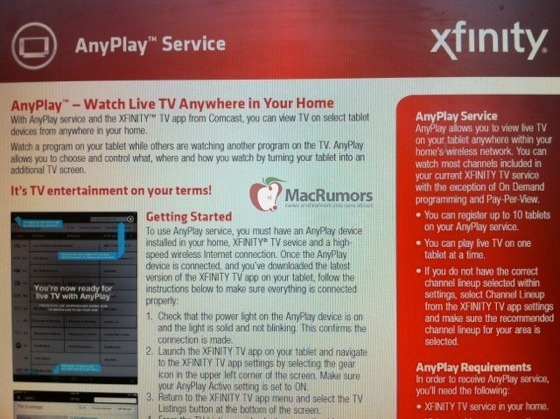 A few (scant) more details have been released on Comcast’s upcoming iPad TV app, AnyPlay. The service was confirmed earlier this year, but no information was leaked on the specifics of the app. MacRumors got a few tidbits, and it seems what’s in the works for the Comcast app will be a bit limited as far as where the app can be used and what equipment is required to stream with AnyPlay. …AnyPlay, allows Comcast subscribers to view live television on their iPad as long as it’s connected to their home network; users must have a special Motorola box which, apparently, takes the live cable stream and sends it directly to the Xfinity TV iPad app over a local wireless network. The service won’t work over Wi-Fi from other locations, or via 3G. Other solutions, like Time Warner’s, stream live video over an internet connection. Comcast’s AnyPlay appears to be a cable box that sends video to the iPad rather than to a television. Up to ten tablets can be registered to any one home account, but only one may be used to stream content at a time- so if you have a few kids and tablets, the service may not be all that convenient. No launch date was indicated, but the app will be rolling out slowly in “limited markets” when it does hit. Anyplay sounds like a cool service. It looks like it will be a lot like the apps Time Warner and Cable Vision already have. My biggest issue with those apps is they won’t let you leave your home. All the TV companies are pushing “TV Everywhere” options but they are either limited to streaming VOD or they chain you to your home network. I like watching the competition but those companies have some catching up to do if they want to compete with my TV provider/ employer DISH Network. Only the DISH Remote Access app gives me all of my TV channels streaming live to my phone or tablet, anywhere I have 3g, 4g, or WIFI access. I can even watch and control my DVRs content too. DISH seems to be the only company with a true commitment to the TV Everywhere concept. Why would I want to be chained to my home network when I already have TVs with service at home?